An international health economist and expert in Latin American health systems and social sectors, Felicia Knaul, Ph.D., is a professor in the University of Miami’s Department of Public Health Sciences at the Leonard M. Miller School of Medicine and director of the Institute for Advanced Study of the Americas. She is also a full member of Sylvester Comprehensive Cancer Center and holds several secondary appointments. Knaul most recently served as director of the Harvard Global Equity Initiative (HGEI) and associate professor at Harvard Medical School. 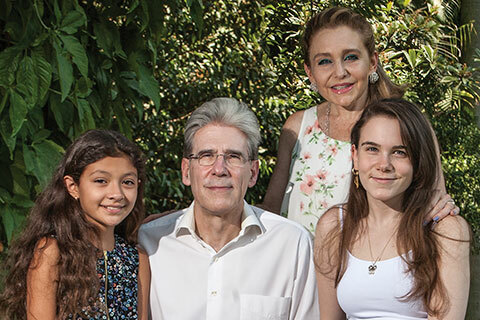 Knaul – who is married to UM President Julio Frenk – is also keenly interested in student life on campus, and University activities. The couple, who reside at Ibis House at Smathers Four Fillies Farm, have two daughters, Hannah Sofia (21) and Mariana Havivah (13). Collaborating with faculty at Sylvester Comprehensive Cancer Center at the University of Miami, she contributes to research and teaching in cancer and global health as well as catalyzes the University's research presence throughout the Americas focusing on policy development. research focuses on global health, cancer and breast cancer in low- and middle-income countries, women and health, health systems and reform, health financing, access to pain control and palliative care, poverty and inequity, gender equity and female labor force participation, and children in especially difficult circumstances. Knaul has created and designed several research and advocacy networks. From 2014-2017 she served as Chair of the Lancet Commission on Global Access to Palliative Care and Pain Relief, lead authoring its October 2017 final report “Alleviating the access abyss in palliative care and pain relief – an imperative of universal health coverage.” She has also published several papers on Mexico and health reform in The Lancet and was a member the Commission Report on Women and Health and leading co-author of its final report. As Director of HGEI, she founded and directed the Global Task Force on Expanded Access to Cancer Care and Control, serving as lead author and co-editor of the task force’s publication Closing the Cancer Divide: An Equity Imperative (Harvard University Press/ Harvard Global Equity Initiative, 2012), and was a member of the Global Task Force on Radiotherapy for Cancer Control (GTFRCC), taking a leadership role in the global reports that were produced. Knaul has produced over 190 academic and policy publications. She has held senior government posts in Mexico and Colombia and worked for bilateral and multilateral agencies including the World Health Organization, the World Bank, and UNICEF. She maintains a research base in Mexico anchored at the Mexican Health Foundation. In 2017, Dr. Knaul was inducted into the National Academy of Medicine of Mexico and awarded Level III of the Mexican National System of Researchers. Knaul works as both a researcher and advocate on cancer globally. After she was diagnosed with breast cancer in 2007, Knaul founded the Mexican non-profit organization, Cáncer de Mama: Tómatelo a Pecho, a program that undertakes and promotes research, advocacy, awareness, and early detection initiatives for breast cancer in Latin America. Her journey is documented in her books Tómatelo a Pecho (Grupo Santillana, 2009) and Beauty without the Breast (Harvard University Press/ Harvard Global Equity Initiative, 2013), and has been featured in Reforma, The Miami Herald, The Lancet, Science, WHO Bulletin, Newsweek en Español, and Cancer Today. She is also the President of the Latin American Union against Women’s Cancers (2016-18), a coalition of 22 Latin American women’s cancers NGOs from 10 countries. She is a member of several institutional boards, including United Way of Miami-Dade and the EAT Foundation, and various academic journals including the Lancet Global Health. After earning her B.A. in Economics and International Development from the University of Toronto, Knaul received a M.A. and Ph.D. in Economics from Harvard University. She is a citizen of Canada and the UK and a permanent resident of Mexico. The family moved to Florida from Sudbury, Mass. with their dogs, Tikvot and Lupi. They also maintain a home in Cuernavaca, Mexico.